Oh Ruby! – Tomato Town organically grows heirloom tomatoes in the greater Kansas City area as well as Johnson County, Leawood, Lenexa, Olathe, Shawnee, Merriam KS, Independence MO and Kansas City Missouri, KCMO. Varieties include: Cherokee Purple, Brandywine, Stupice, Carbon, Black Krim, Black Cherry, Yellow Pear, Absinthe and Aunt Ruby’s German Green. 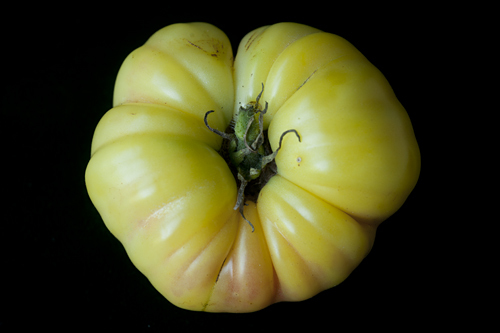 Aunt Ruby’s German Green has been one of our favorite tomatoes this summer. 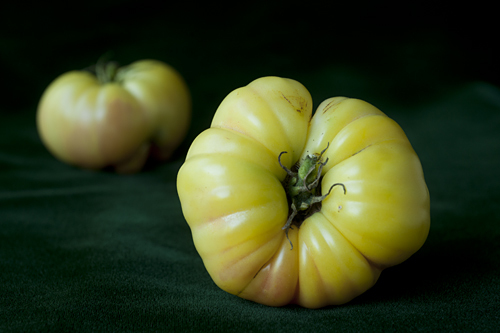 Few experiences rival the thrill of cutting into one of these fine, green beefsteak tomatoes. With a table full of blushing tomatoes, one can be forgiven for thinking that Aunt Ruby is not yet ripe. But the juicy taste of an Aunt Ruby is the greatest reward for remembering that green is the new red! This entry was posted on Thursday, September 2nd, 2010 at 8:49 am. It is filed under TomatoTown Favorites, Varieties. You can follow any responses to this entry through the RSS 2.0 feed.